ABSTRACT: Two simple, rapid, precise and accurate spectrophotometric methods have been developed for simultaneous analysis of Paracetamol (PCM) and Tapentadol (TAP) in their combined dosage form. Method A, First order derivative method involves measurement of absorbance at 257.060 nm (for TAP) and 289.406 nm (for PCM) in first order derivative spectra. Method B, Second order derivative method involves measurement of absorbance at 238.391 nm (for TAP) and 279.381 nm (for PCM) in Second order derivative spectra. Developed methods were validated according to ICH guidelines. 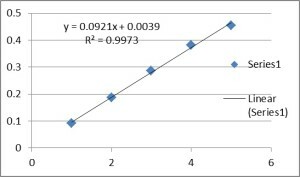 The calibration graph follows Beer’s law in the range of 1.0 to 5.0 μg/mL for Tapentadol and 6.5 to 32.5 μg/mL for Paracetamol with R square value greater than 0.997 (for Method A) and 0.998 (for Method B). Accuracy of all methods was determined by recovery studies and showed % recovery between 98 to 102%. Intraday and inter day precision was checked for all methods and mean %RSD was found to be less than 2 for all the methods. The methods were successfully applied for estimation of Paracetamol and Tapentadol in marketed formulation. INTRODUCTION: Tapentadol (TAP) chemically is 3 - [(1R, 2R) -3 -(dimethylamino) –1 - ethyl-2 -methylpropyl] phenol Monohydrochloride (Fig. 1), is an agonist at the µ-opioid receptor and as a norepinephrine reuptake inhibitor 1. This dual mode of action provides analgesia at similar levels of more potent narcotic analgesics such as hydrocodone, oxycodone and morphine, but with a more tolerable side effect profile. Tapentadol is not official in Pharmacopoeia. Paracetamol (PCM) Chemically is 4-hydroxyacetanilide (Fig. 2), used as antipyretic and analgesic 2. Paracetamol is official in Indian Pharmacopoeia (IP), British Pharmacopoeia (BP) and United States Pharmacopoeia (USP) 2, 3, 4. Objective of Study: Survey of literature revealed that numbers of method have been reported in literature for the individual analysis of Tapentadol and Paracetamol by UV spectrophotometric and RP-HPLC method. UV spectrophotometric method available in literature for simultaneous determination of Paracetamol with other drugs like Aceclofenac, Lornoxicam, Etodolac, Nimesulide,5, 6, 7, 8. RP-LC method available in literature for simultaneous determination of Paracetamol with Tapentadol 9. RP-HPLC and UV Spectrophotometric method available in literature for determination of Tapentadol 10, 11, 12, 13. However, to our knowledge, there is no reported uv-spectrophotometric method available for simultaneous estimation of Tapentadol and Paracetamol. The aim of the present work was to develop easy, economic, accurate, specific and precise spectro-photometric methods for simultaneous estimation of Paracetamol and Tapentadol in bulk drugs and combined pharmaceutical formulations and validation of newly developed analytical methods. Apparatus and Software: Shimadzu UV-1800 double beam spectrophotometer connected to a computer loaded with Shimadzu UV Probe 2.34 software was used for all the spectrophotometric measurements. 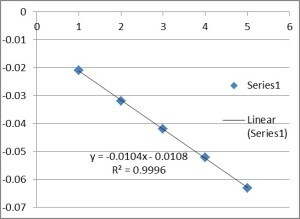 The absorbance spectra of the reference and test solutions were carried out in 1cm quartz cells over the range of 200-400 nm. Contech analytical balance with minimum weighing capacity of 1mg was used in the study. Reagents and Chemicals: Solvent: NaOH analytical reagent grade (Poly-Chem Limited, Mumbai, India). Water, single distilled water. Site: Department of Quality Assurance, N. R. Vekaria Institute of Pharmacy, C. L. College Campus, Bilkha Road, Junagadh-362001, Gujarat, India. Preparation of Working Standard Solution: From the above solution, standard stocks solutions of PCM (100 μg/mL) and TAP (100 μg/mL) were prepared by transferring 1 mL aliquots to 100 mL volumetric flasks and making up the volume with 0.1N NaOH. Then working standard solution of TAP (10 μg/ml) was prepared from previous solution (100 μg/ml) by transferring 1 mL aliquots to 10 ml volumetric flask and making up the volume with 0.1N NaOH. 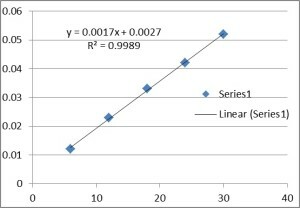 Preparation of Calibration Curve of Standard PCM and TAP: From working std. solution of PCM (100 μg/ml) 0.65, 1.3, 1.95, 2.6 and 3.25 mL were transferred to 10 ml volumetric flasks and volume were made up to the mark with 0.1N NaOH. This gives 6.5 to 32.5 μg/mL of PCM. From working std. solution of TAP (10 μg/mL) 1, 2, 3, 4 and 5 mL were transferred to 10 mL volumetric flasks and volume were made up to the mark with 0.1N NaOH. This gives 1.0 to 5.0 μg/mL of TAP. First Order Derivative Method: The solutions of standard PCM and TAP were prepared in the range of 1.0 to 5.0 μg/mL and 6.5 to 32.5 μg/mL respectively. 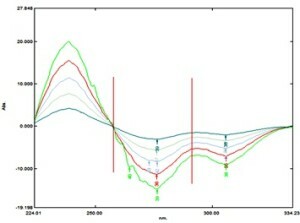 The absorption spectra of the solutions of PCM and TAP were recorded in the range of 200 nm to 400 nm and were stored in the memory of the instrument and transformed to first derivative with Δλ = 2nm and scaling factor 200 (Fig. 3, 4, 5). At 257.060 nm, PCM is having zero crossing point and TAP can be determined. At 289.406 nm, TAP is having zero crossing point and PCM can be determined. The amplitudes at 257.060 nm were plotted against respective concentrations of TAP and the amplitudes at 289.406 nm were plotted against the respective concentrations of PCM for the preparation of calibration graph. 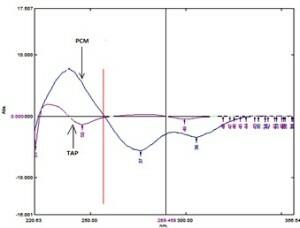 Calibration graph for TAP and PCM are shown (Fig. 3.1 & 4.1). Second Order Derivative Method: The solutions of standard PCM and TAP were prepared in the range of 1 to 5.0 μg/ml and 6.5 to 32.5 μg/ml respectively. 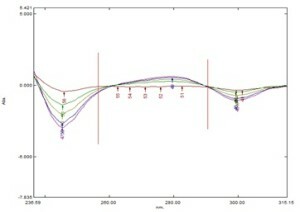 The absorption spectra of the solutions of PCM and TAP were recorded in the range of 200 nm to 400 nm and were stored in the memory of the instrument and transformed to second derivative with Δλ = 2nm and scaling factor 20 (Fig. 6, 7). At 238.391 nm, PCM is having zero crossing point and TAP can be determined. At 279.381 nm, TAP is having zero crossing point and PCM can be determined. The amplitudes at 238.391 nm were plotted against respective concentrations of TAP and the amplitudes at 279.381 nm were plotted against the respective concentrations of PCM for the preparation of calibration graph. 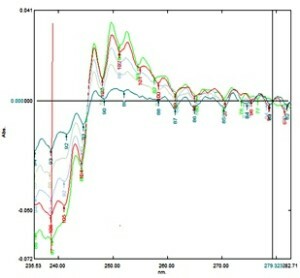 Calibration graph for TAP and PCM are shown (Fig. 6.1 & 7.1). Assay of Commercial Formulation by Method A and B: 20 tablets were powdered and an amount equivalent to 10 mg TAP and 65 mg PCM was weighed and dissolved in 0.1N NaOH. Solutions were filtered using whatmann filter paper grade 1. Appropriate dilutions were prepared in 0.1N NaOH taking suitable aliquots of the clear filtrates and subjected to analysis using both methods described above. The result of analysis is reported in Table 1. 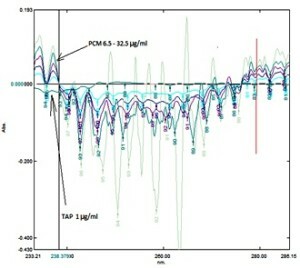 RESULTS AND DISCUSSION: Developed spectrophotometric methods for the simultaneous estimation of PCM and TAP were validated according to ICH guidelines and data complying with the standards were obtained. The results of validation parameters for both developed methods are reported (Table 2 and 3). Method % Spiking Cactual (µg/mL) Cadded (µg/mL) Cfound (µg/mL) % Recovery ± S.D. CONCLUSION: Two Spectrophotometric methods (First and Second order derivative) were developed for simultaneous estimation of PCM and TAP in their combined formulation without prior separation. Methods were found to be precise and accurate as can be reflected from validation data. Developed methods were successfully applied for estimation of PCM and TAP in marketed formulation. Indian pharmacopoeia Vol II, The Indian Pharmacopoeia Commission, Govt of India Ministry of Health and Welfare, Ghaziabad, 2010, p. 1859. United State Pharmacopoeia, United State Pharmacopoieal Convention, 2002 p. 1263. Ashraful Islam SM, Abuzar S and Paul PK: Validation of UV-Spectrophotometric and RP-HPLC methods for the simultaneous analysis of Paracetamol and Aceclofenac in marketed tablets. Int. J. of Pharm. & Life Sci. 2011; 2 (12): 1267-1275. Sivasubramanian L, Lakshmi K.S and Tintu. T: Simultaneous Spectrophotometric estimation of Paracetamol and Lornoxicam in tablet dosage form. Int J Pharm Pharm Sci. 2010; 2 (4): 166-168. Balan P, Carolin Nimila I, Lakshmi Prasanna M, Vanaja Rani M and Rajasekar S: Simultaneous estimation of Etodolac and Paracetamol by UV Spectrophotometric method in tablet formulation. Journal of Pharmacy Research 2011; 4(6): 1663-1665. Kirtawade R, salve P, Seervi C, Kulkarni A and Dhabale P: Simultaneous UV Spectrophotometric Method for Estimation of Paracetamol and Nimesulide in Tablet Dosage Form. Int.J. ChemTech Res. 2010; 2(2): 818-821. Ramanaiah G, Dr. D. Ramachandran, Srinivas G, Jayapal G, Rao P and Srilakshmi V: Development and Validation of Stability Indicating RP-LC Method for Simultaneous Estimation of Tapentadol and Paracetamol in Bulk and its Pharmaceutical Formulations. Int. J. of Chem and Analytical Sci. 2012; 4(7), 391-396. 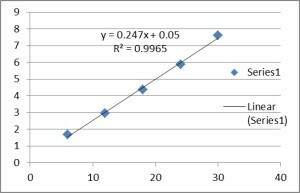 Sherikar OD and Mehta PJ: Development and Validation of RP- HPLC, UV-Spectrometric and Spectrophotometric Method for Estimation of Tapentadol Hydrochloride in Bulk and in Laboratory Sample of Tablet Dosage Form. Journal of Chemical and Pharmaceutical Research2012; 4(9): 4134-4140. Kanzariya RP, Kapuriya KG and Faldu SD: Method development and validation of Tapentadol hydrochloride in bulk drug and pharmaceutical dosage form, Inventi Rapid: Pharm. Ana & Qual.Assur 2012. Pavan Adithya B, Mahesh J and Vijayalakshmi M: Spectrophotometric estimation of tapentadol in bulk And its pharmaceutical formulation. Journal of Chemical and Pharmaceutical sciences 5(2): 52-55. Bhatasana PT and Parmar AR: Development and validation of RP-HPLC method for estimation of Tapentadol hydrochloride in its tablet dosage form. Der Pharmacia Sinica 2012; 3(4): 422-426. Beckett AH, Stenlake JB, Practical pharmaceutical chemistry, 4th edition, part -2, new delhi, CBS publication, 1997, p. 285-288. ICH Q2 (R1), Validation of analytical procedure, Text and methodology, Geneva, International conference on Harmonization, 2005. Khokhar V and Shah RM: Simultaneous estimation of Paracetamol and Tapentadol in combined dosage form by Derivative method. Int J Pharm Sci Res 2013; 4(5); 1777-1781.